Keep the Poison Control Number At Your Fingertips « Howard J. Bennett - Pediatrician and Author in Washington, D.C.
Up until a few years ago, poison control numbers were regional and people had to call 411 to get the local poison control number if they needed help when they were out of town. Because this made the system inefficient, the poison control network now has a national number: 1-800-222-1222. 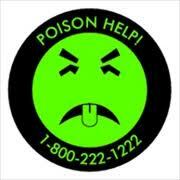 This means that regardless of where you are in the country, if you call this number, you will automatically be connected to the closest poison control facility. Not only does this number belong on every phone in your house, but you should also program it into your cell phone. The reason for this extra precaution is that children sometime ingest poisons while they are outside of the home, and you may not be thinking clearly in this situation. This entry was posted in Dr. B's Blog and tagged emergencies, safety.